Over at Linoleum Dynamite you’ll find a chocolate cake recipe. It will take you all of seven minutes to make and will only use one bowl. Never made a cake from scratch? It’s not scary, promise. And it’s worth it, promise. Your Valentine would think the world of you, promise. Third. Oven thermometer. My oven can be off anywhere from 25 to 50 degrees depending on the weather. Don’t trust what you set it at. Trust an oven thermometer. Even if you have a digital convection oven, use an oven thermometer. Trust me. Fourth. DON’T OPEN THE FREAKING DOOR. Every time you open the oven door you lose 25 to 50 degrees of heat. Which means the oven has to recover that heat before it can continue baking as usual. Recovery=longer baking time, drier baked goods and *gasp* fallen baked goods. KEEP THE DOOR SHUT. 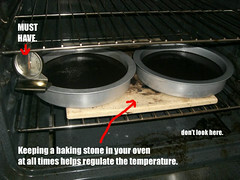 If you must check in on your food, get a baking stone and keep it in your oven at all times. It will retain heat and help your oven recover faster from all of your nosiness. Fifth. Let your cake cool all the way before you frost it. Unless you like mushy piles of cake be patient. Good frosting is made mostly from what? Butter. And butter melts when put on something warm. Melted butter is slippery. Get my point? The last thing I can think of is flour. Maybe you’ve seen cake flour. Cake flour has a lower protein content than all purpose flour and all purpose flour has a lower protein content than bread flour. Cake flour will give you a very light, tender cake. All purpose flour will give you a sturdier, denser cake. Cake is the result of a bunch of tiny air bubbles formed by steam trapped inside the protein of the flour. How tough those air bubbles are depends on how much protein is in your flour. Let’s say cake flour is like a bubble blown with bubble gum. Soft and easy to break. (Soft, tender cake) All purpose flour will give you bubbles that more resemble a latex balloon, thin, but harder to pop. Bread flour ends up being more like a rubber ball. Much harder to pop and therefore chewier and denser (think french bread). If that analogy doesn’t make sense to you I’m sad, because it totally makes sense to me. So there’s my cake knowledge. Go forth and prosper. And check out the recipe at Linoleum Dynamite. I drew a happy face on the finished product. Indy is 128 miles from my house. I humbly request that you hop in your car and deliver said cake to my house, as I am currently too pregnant to make it. Ok, that made sense to me. (Especially the foreplay part. We won’t discuss what that says about ME). That explained a lot I didn’t know and some I knew but didn’t really “Get”. Maybe there is hope for my lack of baking skills after all..
Loralee’s last blog post..Sideblog:Caught up! that was a fabulous analogy. fabulous. Oh, I love the hints and tips. I usually prepare my cake pans that way, so at least I’m on the right track. And I’ve been looking for ways to keep my homemade cakes more moist (instead of resorting to the box mixes). I will take your advice. Now like Mrs. Chicken said, I don’t live too far from Indy (175 miles for me). But I’d like to come for a cooking class…and maybe a few samples. I’ve been schooles. Seriously- I know NONE of that. I’ve never made a non-box-cake in my LIFE. Do you have to have a Kitchenaide? Schoole-D, I meant schooled. And somehow now that doesn’t look right to me either…. You have a baking stone? I suddenly realized that I have no business looking on your cooking blog. You are a pro and I am way out of my league here. I am impressed though! You make beautiful food…. and babies. I was serving chicken, burnt on the outside, raw on the inside less than three years ago. If there was hope for that girl there’s hope for anyone. Second, I am so excited you are doing this. I just tried making French bread yesterday. I didn’t even know that they made bread flour! I have a baking stone, I’ll stick it in there. Now I need to get a oven themometor. And I will stop opening the door! Truly, you have a gift. Thank you so much for sharing it!! Smiling Mom’s last blog post..Go vote for me!! Matthew has the biggest sweet tooth on the planet. I am SO MAKING THIS. I totally understood the bubbles…i actually was wondering what the difference of protein content played in baking…i love homemade bread and i have never been afraid to make a cake from scratch just too lazy, so i am now thinking i will need a few more different containers for flour: cake flour, semolina (pasta) flour, all purpose, and bread flour! need more containers! Wow! I totally learned something today, that makes today a good day. Thanks for the great baking advice. (loved the video) I’m making a cake for my love’s birthday this week, so perhaps I will try your tips since I have more time on my hands now. …and Alton is the bomb!!! Lynne’s last blog post..Finally Free? The only thing better than this post, is if you made the cake for me. I love you! That is one seriously yummy looking cake. Okay, really I need more lessons (maybe when Seminary is over??). Wow. I didn’t know that opening the oven door would cause that much heat loss. I open the door all the time. I guess it’s time to replace that oven light. Good tips – especially the room temp one! I love Alton – the nerdery is so enchanting. My Mom always told me to crack my eggs in a separate bowl first. I thought it was unnecessary until I had to try and fish eggshell out of a big bowl of cake ingredients. I love the Alton Brownish scientific info. I took a food science class in college that reminds me of the info on his TV show but Alton is way more interesting! Thanks for the book tips too. I really enjoy making food but am lazy, you are an inspriation! I had no intentions of making cake today and then I come out your blog with my boys sitting beside me…they see the cake and are now begging for it..thanks Casey! Thanks for the tips and the scientific explanation of cake. If you’d been my science teacher in high school, maybe I would’ve cried less. Story: The last time I made a cake from scratch I made a mistake (I know what it was, but feel too ashamed to say, because it was pretty stupid) that made the cake stick to the pans A LOT. But whatever, I pieced it together as much as I could (which wasn’t much–it was basically a pile of cake), frosted it, took it to a party, and it got devoured in about ten minutes. So when it comes down to it, I guess people don’t care if the cake is ugly. Good news for me. thanks for a great looking post! I think I’ve broken every single one of those rules for making a good cake. No wonder my last homemade cake was so sucky! I just found your blog through Stumble, and it is so awesome. My hubby and I were laughing about your Doctor visit I’ll be checking back ofter. i actually have never used cake flour and i make homemade cakes all the time (i an anti-mixes) hmmm..will definitely try it! One last piece of advice for would-be bakers: do not purchase the folding-leg-style cooling racks. Yes, they save space but those racks secretly hate you and will randomly buckle under the weight of an elaborate four-layer cake you are making for your special Valentine, tossing said cake layers onto the kitchen floor where they will be immediately attacked by two cake-starved toddlers. This will likely happen while you are in the bathroom, having a hasty pee. 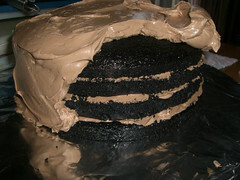 I haven’t made a scratch cake in a while, but this post totally makes me want to do it again. Although, I fear Sacha may end up like the moosh, covered in chocolate, and rolling in the flour for giggles afterward. He thinks he’s funny that way. Your blog has changed since I’ve last been here…love the new look!! Your pict is gorgeous, too!! And here I thought I knew something about baking cakes. I’m going to write these notes down on a card and stick it in my recipe basket. You should feel special…only the bestest recipes and ideas go into that recipe file. You are a domestic goddess. I love how you were all business in the cake pan lining video. You take baking very seriously, don’t you? I must try this out – it looks so much better than the things I make out of the boxes. Okay – what about baking above 7,000 feet? I have studied how leavening agents change, how the atmospheric pressure affects this – how the lowered boiling point (186 versus 212) and dry air affect things. And still – my baking is barely improving since we moved from sea level nearly four years ago. Once upon a time – bread and pastries were easy for me. Now they’re rocket science. How much would you charge me to just one-day ship me that cake? Jen M’s last blog post..Want to Read About Pain? Great tips. And that was a pretty cool video. Thanks so much for the tips. I have a from scratch German Chocolate Cake that is highly requested and FABULOUS!!!! Oh my gosh that looks delicious!!! I am off all sweets right now for a little “family health challenge” and just looking at that cake about did me in!! I think I will make it for my little girls birthday party… Your cooking ability amazes me! Where did you learn these fancy tricks of the trade?? OMG this looks soooo good. I NEED a piece. Please? Not only does that look too good for words but once again (second time today) I learned something from your blog. I had NO clue about the different flours—but it totally makes sense. And makes me want to bake. I’m drooling here Casey!